When you donate at least $100 to NeighborLink Indianapolis before December 31, you could have the opportunity to write off up to half of your donation on your 2017 state income taxes. With Neighborhood Assistance Program (NAP) credits, you can reduce your state income tax liability by 50% of your donation amount. For example, if you decide to donate $200 dollars to NeighborLink Indianapolis, you can reduce your state income tax liability by $100. Your $200 donation is also tax deductible on your federal taxes, saving you even more. The minimum to donate and earn NAP credits is $100. The State of Indiana awarded NeighborLink Indianapolis $11,000 in NAP credits for 2017. The state awards NAPcredits to non-profit organizations that help the community in areas like affordable housing, job training, and neighborhood revitalization. The $11,000 NeighborLink Indianapolis receives in NAP credits equates to $22,000 in donations. NeighborLink Indianapolis will provide you with a confirmation of your donation, which you must use to claim your NAP credits when you file your taxes. 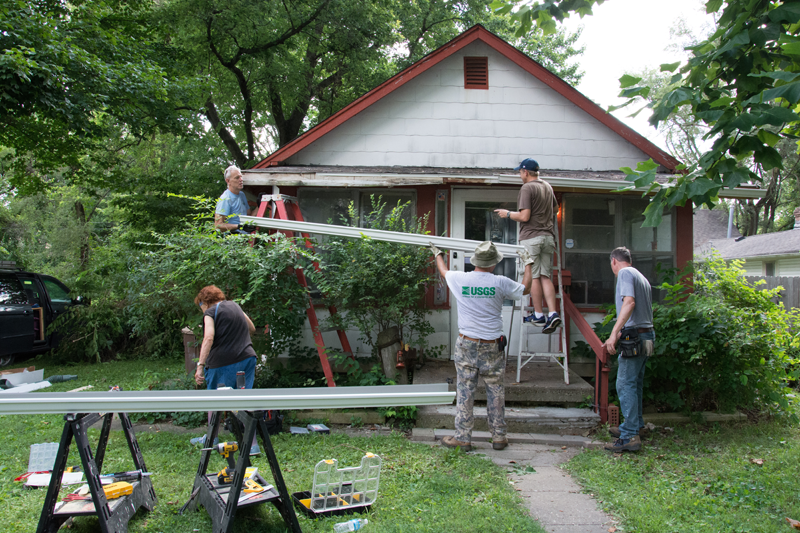 NeighborLink Indianapolis helps hundreds of seniors and individuals with disabilities live independently with dignity every year by offering free home repairs and improvements. With the help of NeighborLink Indianapolis, many people in Indianapolis are able to keep their homes, independence, and quality of life. We work hard to ensure that your tax-deductible donation goes to completing as many projects as possible. If you want to donate and earn NAP credits, you should act fast. They go quickly, the last day to donate is December 31. As we approach a time of giving thanks this season, ask yourself, “Would I still be thankful if everything I owned was taken away from me?” A fire burned their home in April 2016, now Michael and Debbie struggle to recover. Even with the loss of everything they own, including their home, Michael and Debbie bless each person they come across and are grateful for the people who have entered their lives since the fire. Their home sits on the southside of Indianapolis. The small bungalow built by Debbie's father-in-law in the 1940's draws no attention from the thousands of commuters passings it daily on their way to and from work. The outside of the house is similar to the other homes that line the street. The inside however, is far from similar. After the fire, it had to be completely gutted. The fire and smoke damage destroyed everything in the home—walls, floors, and ceiling. Debbie, 56, has spent her entire life on the southside of Indianapolis, attending Manual High School, and spending time at Garfield Park. Her mom instilled the value of hard work in her at a young age. She learned she needed to work hard for what she wanted. As a child, Debbie went door to door selling produce and also cut grass—anything to make money and help support her family. Debbie dropped out of school so she could work more hours, but soon realized that her inability to read and write was keeping her from getting a better paying job. 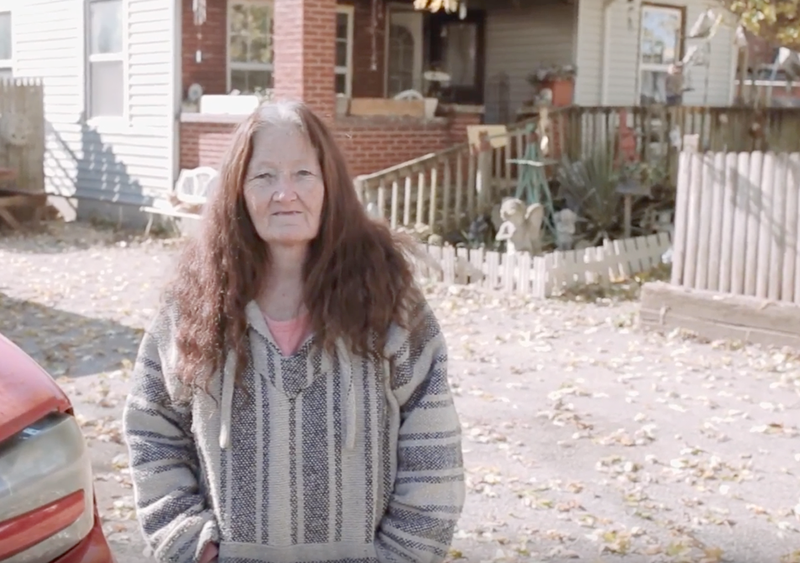 "I worked at White Castle, but can't read and write, so that didn't last too long.” Today, Debbie’s full-time job is caretaker to her partner, Michael. Michael is in a wheelchair, on dialysis three times a week, and requires blood transfusions every 2-3 months. Julie Niec, a caseworker for Neighborlink and a retired social worker, was introduced to Michael and Debbie after they lost their home and now drives the mission to help them recover. Julie wants to help because she sees Debbie's hard work and believes she deserves more in life. "Debbie works so hard to make it through life," says Julie. "Debbie's story is different than others, because she's not afraid to work hard for what she wants. She's a little person, she's small and not muscle-bound, but she's delightful to talk to. There's a chance her husband might lose part of his foot, but Debbie keeps going. I mean she just keeps going." Neighborlink is attempting to help Michael and Debbie get back into their home before severe winter weather, but needs your help. Julie says "There's no other group that would have taken on management of a situation like this (coordinating volunteers and donations), I don't think there'd be much of a chance that they could be back in this home." Julie hopes that Michael and Debbie will not have to spend another holiday outside of their home. She says, "Maybe this could be a part of your Thanksgiving or Christmas, giving to this family. Debbie is the caregiver, she's always taking care of others and not herself. ...The most important thing is that these are very deserving people, and we need to be better aware of those who have contributed and have been wonderful citizens but have run into trouble that they cannot handle on their own, and this is something we can reach out and do for them." Michael and Debbie are in need of almost everything, but if you can provide all or part of the items on the list below, it will help Neighborlink reach their goal of getting them back into their home. Dishes, silverware, cookware, kitchen towels, dishcloths, small kitchen appliances, and other kitchen items, bath towels, lamps, sheets (queen and twin) blankets, curtains vacuum, cleaning items (mop, broom, etc). Make a financial donation here or email if you have items to donate. We would also like to recognize the businesses who have contributed labor, supplies, expertise, and more to this project, THANK YOU! 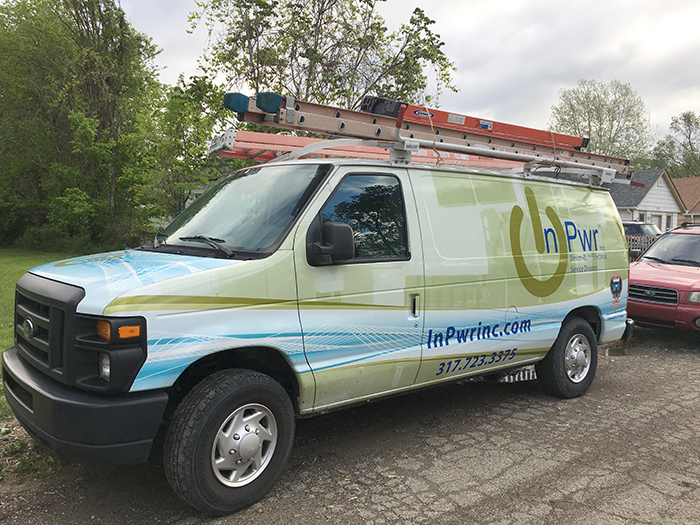 IEC along with InPwr, Inc.
We are grateful for every volunteer that comes our way. 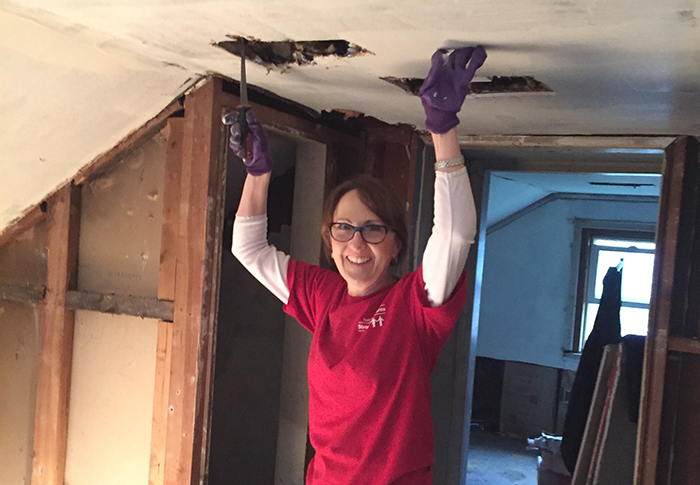 We're totally blown away when one of those awesome volunteers turns into a company service project, specifically a company that knows a thing or two about construction. Chip Moreland of CRG Construction was just such a volunteer. 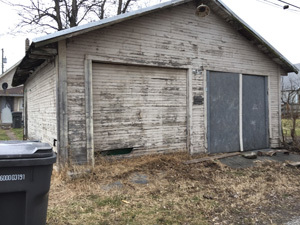 He volunteered to take on a garage that had been cited by the city for needed repairs. CRG offered to give it a full-on "Garage Make Over." We're not ones to argue with such an offer. 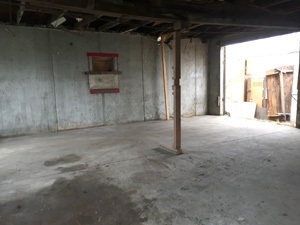 We notified the homeowners that we could take on their garage we just needed to have it cleared out by that following week. We would help her clear it out, we just needed them on board with the process. 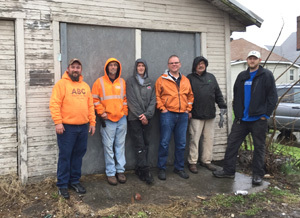 Not only were they more than willing to clear their garage, they were thrilled that a construction company had willingly agreed to help them. The homeowners are a senior mother and her daughter. The mother was mostly confined to her bed, but eagerly looked forward to updates from her daughter who jumped right in to get her hands dirty with us. The project wasn't on for a novice team. 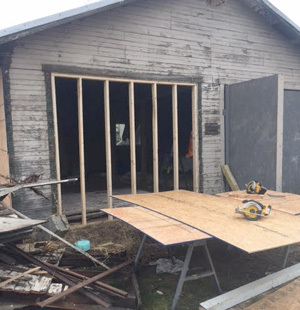 The garage needed extensive repairs to the framing before any kind of exterior beautification could happen. 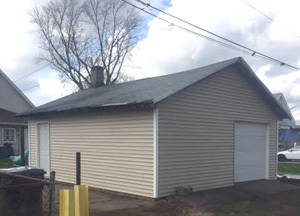 CRG began their task on March 31st and wrapped up in late April, but in the end, the homeowners had practically a new garage! New framing, more secure siding, new door frames and more. They were beside themselves with joy. CRG Construction took care of everything! Projects like these come onto our waitlist and many times, have to remain there until we can find enough skilled volunteers to take on the project. When city citations are involved, we work with the city to extend timelines when possible by showing bits of progress is happening. It tends to take a much longer time than the swift month that this garage was take care of. We don't always know the circumstances that lead a city to call a citation on a resident. Sometimes its a neighbor who is fed up with tall grass or a broken down garage. Sometimes the city takes notice and does so for safety reasons. Rarely is it sheer negligence of the homeowner. Many of the individuals we speak to have a great affection for their homes and are saddened by the fact they are not physically as capable as they once were nor are their pockets as deep as they were retirement. 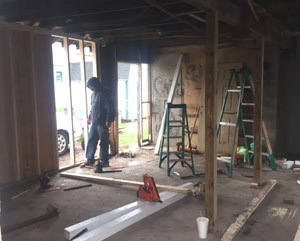 Next time you spot a regular "eye-sore" in your neighborhood, consider getting to know your neighbor and learning more of the "why" behind it, perhaps you'll be the next CRG Construction crew for that neighbor of yours. 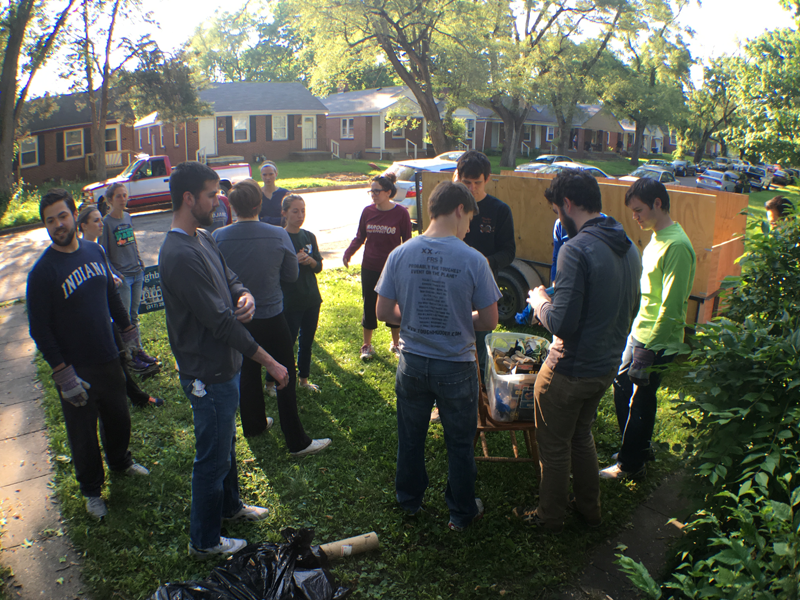 Service projects are not new to Case Design/Remodeling. They are a civic-minded company and have taken part in a variety of volunteer projects throughout their community. This time, however, they were specifically looking for something large enough to engage all of their 45 employees. 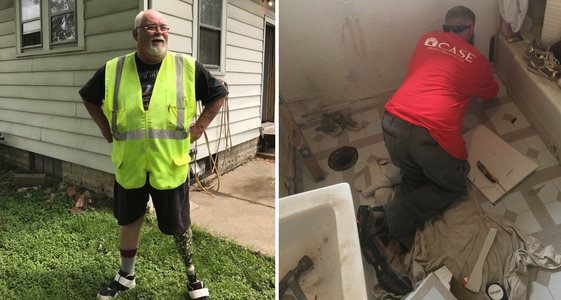 Since Case Design/Remodeling is a home remodeling company, they sought out a volunteer opportunity that would allow them to maximize their impact in the community by playing to their strengths. We, at NeighborLink Indianapolis, have PLENTY of projects to offer their very skilled employees to choose from. 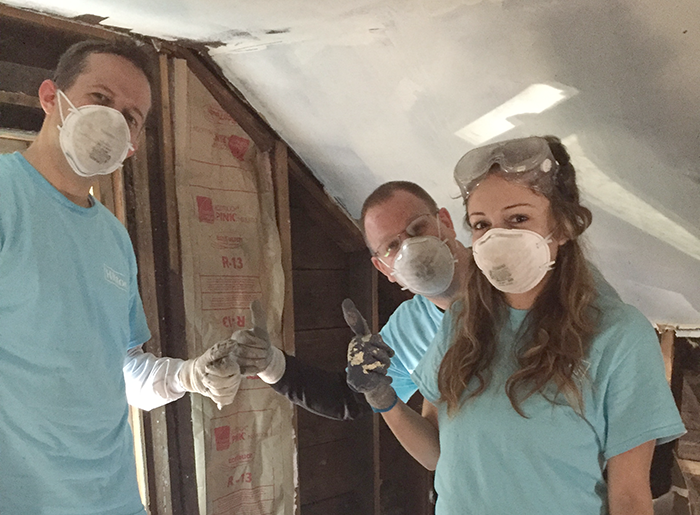 In addition to giving back to the community, Case Design/Remodeling is able to benefit from the team building opportunity these volunteer experiences tend to provide. 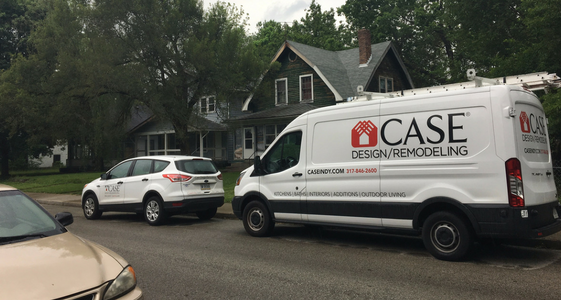 We are extremely excited to be partnering with Case Design/Remodeling this year. They have generously committed to two full days, one on May 19th and the other in the fall, on September 15th. We are anticipating being able to cover six to eight of the larger projects on our waitlist for low-income seniors in Marion County. The cases we will be entrusting to Case Design/Remodeling necessitate highly skilled individuals to complete the to-do lists safely and efficiently. A number of these projects include extensive repair to ceilings due to water damage, floor repairs, and kitchen cabinet building. The anticipated value of the work on the projects combined is about $30,000 to $60,000. That is an incredible donation of time, talent, and resources to the people we serve and we can’t thank Case Design/Remodeling enough. Case Design/Remodeling is a recognized expert in home remodeling, with a proven process that combines innovative design and quality construction all under one roof. Serving the Greater Indianapolis Area for over 13 years, their in-house team of experienced architects, designers, project managers and skilled craftsmen help homeowners achieve their remodeling goals. Their projects come in all shapes and sizes - from complex, large-scale renovations & additions, to basic cosmetic updates. 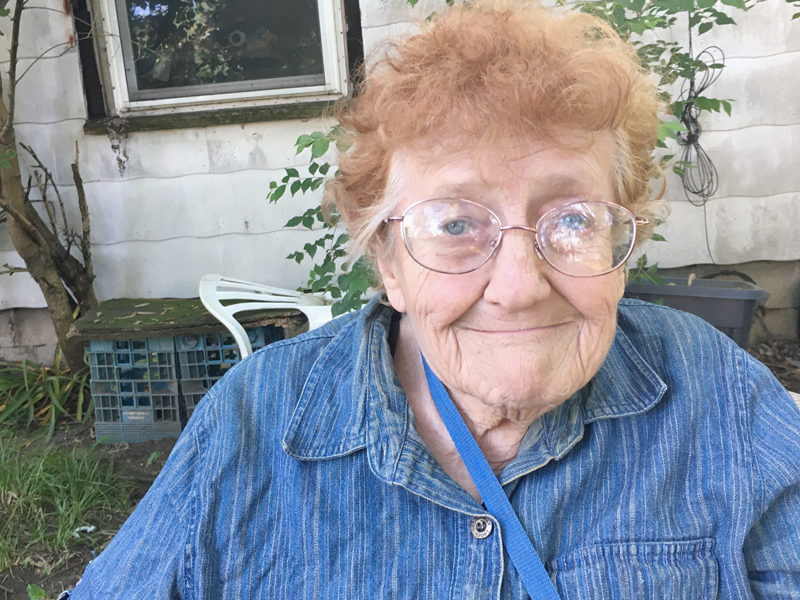 Ruth "Rusty" Meyer, 81, often jokes that she and her 81-year-old house are both going the way of old age. Meyer, who has lived alone on Indianapolis' near-northeast side for the past 31 years, suffers from vision loss and poor mobility. Her home had serious structural and cleanliness issues that limited her quality of life. The Marion County Public Health Department (MCPHD) took notice in May 2016 and issued her a citation. That's where volunteers from NeighborLink Indianapolis came in. After the MCPDH reached out to NeighborLink Indianapolis, professional tradesmen, church groups, businesses and kind-hearted individuals collectively volunteered for the next two months in home improvement, plumbing, maintenance and cleaning to helping Meyer stay in her home--all at no cost to her. Meyer, who retired from AAA Travel after 40 years, is a keen, introverted woman with a love for art, classical music and history, especially Arthurian legends. She's maintained few friendships over the years, but she regularly goes grocery shopping once a month with a neighbor. She pays for groceries with her monthly social security paycheck, her only source of income. Meyer said that she usually prefers the company of animals than people. 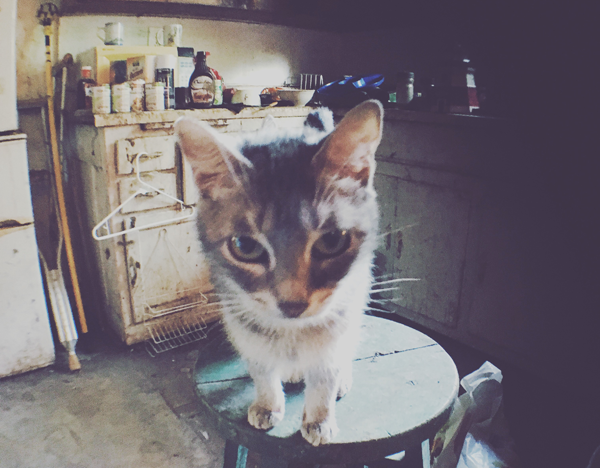 She cares for several neighborhood cats, which she affectionately names. 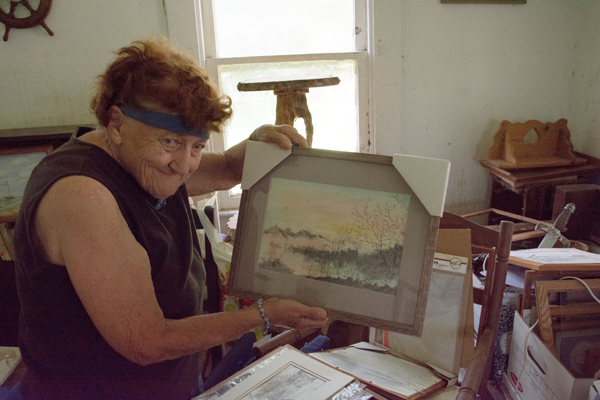 Although Meyer maintains an independent lifestyle, her home was in a desperate situation. Faulty wiring caused a fire that ravaged the house, requiring the flooring be torn out to the subfloor. Meyer suffered a fall several years ago, and while she was in rehab she came home to find her house burglarized with broken windows. Her floors and windows have since been repaired, but the house still needed improvements. Plumbing, maintenance and repairs aside, Meyer had also accumulated enough possessions over the years to constitute a hoarding problem. Narrow corridors carved through the crowded house were the only way to get around. While Meyer said she knows she had too many possessions, she said it is difficult to let go. "When a person of my age has things taken from them, it's like they've lost a part of themselves," Meyer said. "You start to forget you who you are." Meyer did not have a functional stove with which to cook, and she kept her food in a single mini-fridge. She kept her cat food in another mini-fridge that didn't work properly. 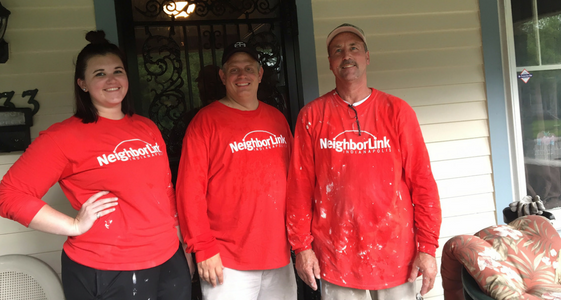 Since NeighborLink Indianapolis got involved with Meyer's case, volunteers managed to perform exterior and interior repairs to the house. Missing gutter pieces were replaced, and the guttering around her home was fixed. A sagging structural area above her front door was repaired so that the door could open and close. 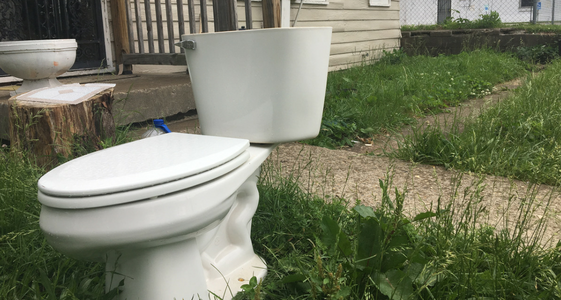 Her toilet has been replaced, and repairs to her bathroom have made it once again accessible. She's been given a microwave to cook with, and her cupboard is now full of canned foods. The exterior of the house has been given a fresh coat of paint, and shrubbery cleared from the side of the home means utility meters can be accessed. "Now the meter man can get an accurate reading of my meter instead of just making an estimate," Meyer said. 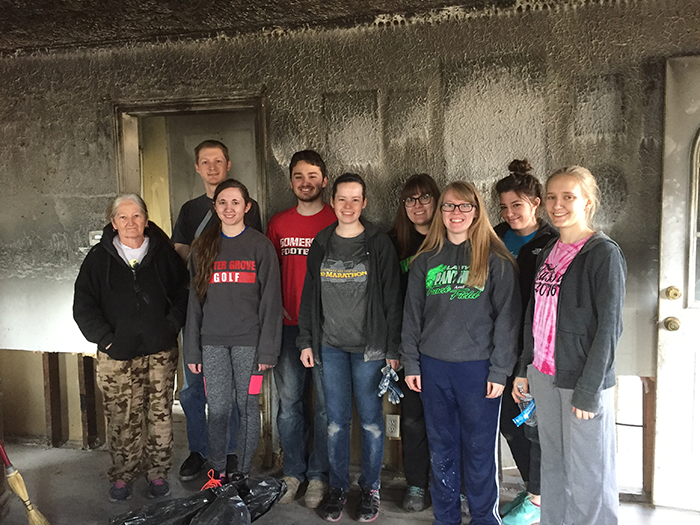 Nearly 20 volunteers helped Meyer clean her floors of possessions, and NeighborLink Indianapolis board member Jeanette Jefferis even spent evenings sitting down with Meyer to go through her collection to help her to decide what to part with.Meyer's home still could use some work. Improvements made thus far, however, have made an impact on Meyer's quality of living. New flooring in the kitchen, cleared clutter and methods of organizing plus a generally more walk-way friendly home have made a big difference in Meyer's ability to move around and care for her feline friends. She's also able to continue submitting artwork to the State Fair, which she has done for the past several years. 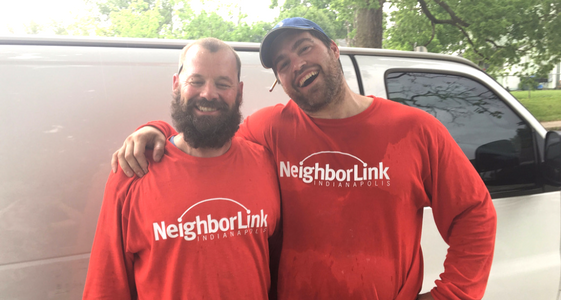 To get involved with projects helping Indianapolis residents like Meyer, visit NeighborLink Indianapolis' website to see open projects in need of volunteers. If you're short on time, consider making a donation to NeighborLink Indianapolis.